When you want the BEST OF THE BEST! This is not your normal signature holder! There are so many different hand signed labels out there it can be confusing. But most those signatures really don't mean much or have much to do with the coin business. Some are just people who have worked at the mint. There are a few signature labels from coins designers which are nice. But what do all those really mean about the actual coins value. For most of them, almost nothing! This is different! Here you have a chance to own a 70 graded coin from one of the top Numismatists in the world! and hand signed by David Hall. Numismatic News called him: "the man who changed the rare coin market forever." Coinage Magazine named David Hall one of the top "Numismatists of the Century." 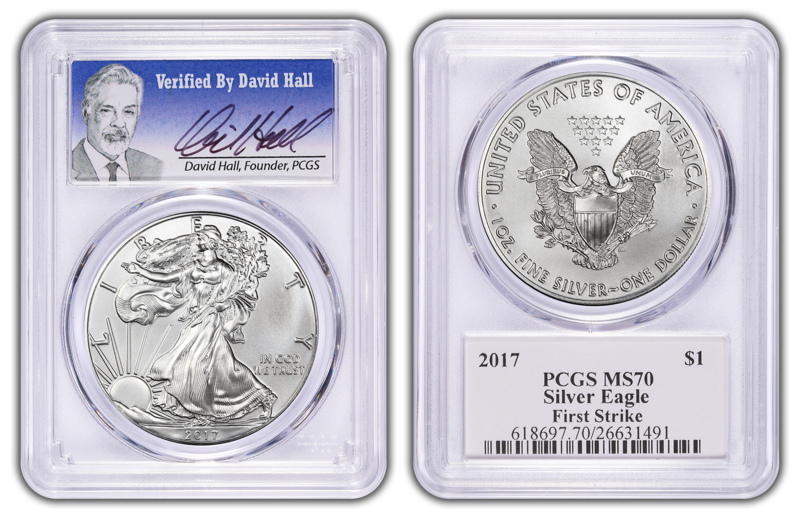 David Hall is the Founder of PCGS! Never in history has their been a chance for modern coin buyers to purchase a coin that has been verified 70 grade by such a prestigious name. In the past only rare coin buyers spending tens if not hundreds of thousands of dollars on a coin would have access to an expert such as David Hall. Our relationship with David Hall allows us to bring this opportunity to modern coins. Paradise Mint is the exclusive distributor for these coins.